Please refer to the images in addition to the text below in order to understand how stressballs are made. First of all a design is created for the particular stress item or individual stress product shape. Then a life size model is created of the design and a gypsum mould is then made to see and approve the final shape of the stress item. Once the gypsum mould is made and the final stress item is signed off a real metal mould set is cast for the stress product. Once the mould set has been made, before production of the stress items commences - the moulds are cleaned. The moulds are then injected with PU Foam - which is the raw material substrate used to manufacture stressballs and stress items. The moulds are then heated to 60 - 70 degrees centigrade and then allowed to cool. 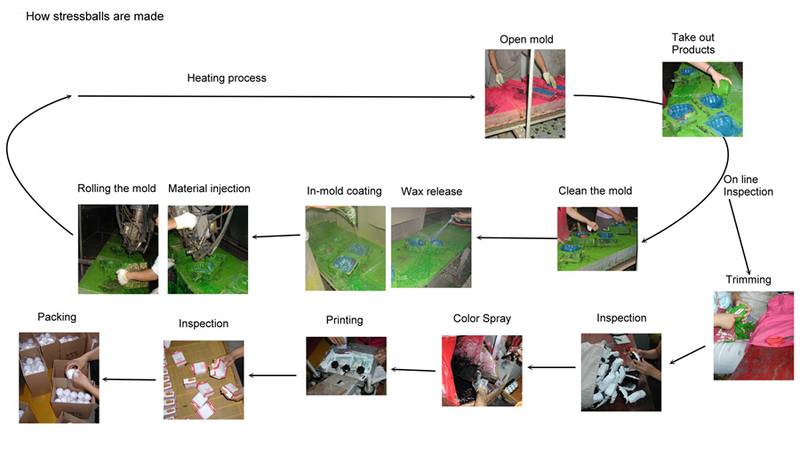 After cooling, the stressballs or stress products are removed from the moulds and the stress items are trimmed and finished. The stressballs or stress items are then colour sprayed according to the stress product design. The stress items are then printed with the customer logos or marketing straplines. The finished and printed stressballs and stress items are then inspected before packing and before shipping. Stressballs and stress products in general, have become a staple part of the promotional item portfolio and are always a popular promotional give away. Stress items are a superb promotional product for trade shows, as they are always popular and make a good and ice breaking talking point. Stress products also make excellent promotional items for new product launches. Lancewich has many years of producing specially made stress product promotional items and we can often replicate new products in a realistic and novel way.